inc: Juggling, Diablo, Plate spinning, Flower sticks, hula hooping, stilts, unicycling & tight rope. and help to increase play, concentration and self esteem levels. 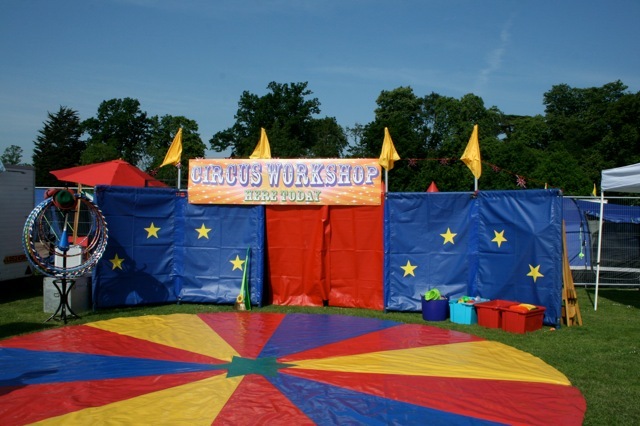 the “Circus Area” a safe and colourful space to learn, play & watch the show! Booking for Summer festivals, schools, Play schemes, and parties. suitable for large grass area’s, sports halls and even large office floors. loading, where possible on grass I can park my red van on site building the show around it. extra CRB checked instructors & entertainers to help with the larger numbers at bigger events. unicycling for Adults and teenagers is also available on request. off the ground for safety. Parents/Guardians may take children across by holding hands.